For most of us, being a professional snowboarder sounds like a dream come true: receiving sponsored gear, chasing snowstorms around the world, owning a decent small business built on the reputation of your name, followed by an insurmountable amount of likes on Instagram. Though it seems enticing, this lifestyle isn‘t at all what we spectators believe it to be. Most professionals are actually about as normal as the average person in the checkout line. Snowboarding professionals often buy their own season passes, travel very little because they lack funding and rarely get noticed in public. For 26-year-old professional snowboarder Madison Blackley, being a pro is about as useful as being a modern-day treasure hunter. Madison Blackley is a shredder from the crew Too Hard. Though Blackley doesn‘t refer to herself as a pro, at this point in her career, and to the rest of the snowboarding industry, she‘s not only a professional but, also, a veteran. She‘s participated in three Dew Tours, has won multiple resort-sponsored rail jams and qualified for the Olympics. What‘s so refreshing about Blackley is that she‘s a realist. 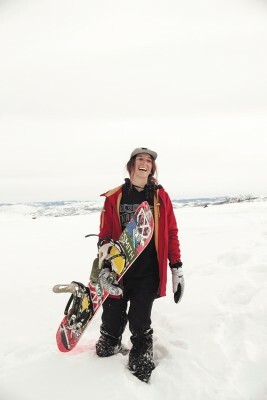 Snowboarding is her passion, but she knows where the sport stands in her existence, and she knows how to keep it real. From a young age, Blackley knew that she wanted to pursue a life as a professional rider, so she threw herself out there by participating in any contest available, making connections with other riders and even postponing college so she could focus on the sport. After years of winning on the contest circuit and gaining sponsors, Blackley realized that snowboarding as a professional was as good as a pipe dream. “The Olympics has changed the game for snowboarders like me,“ says Blackley. “To gain any recognition as an athlete, you almost have to be part of the U.S. Team.“ Three years ago, before the Dew Tour became the qualifying contest for the U.S. Olympic Slopestyle Team, Blackley was ranked fourth among U.S. females. With a ranking that high, Blackley could have made her break into professional snowboarder status. But to level the playing field for the Olympics, only the top three females qualified for the team. The rest of the competitors, including Blackley, lost their ranks, titles and points from a contest that once helped them prove their skill set and talent to the snowboarding industry. “The Olympics permanently changing the contest circuit, coupled with my stepdad passing away, made me realize that I snowboard because I‘m passionate about the sport, not because I‘m passionate about the money or recognition that I could get from it,“ Blackley says. Blackley has learned a lot about who she is and how the conventions of the snowboarding industry can help or hurt the lifespan of a professional. From contest junkie to sophisticated and versatile rider, Blackley knows that the best thing she can do as a snowboarder is to stay confident, play to her strengths and be thankful for the moments she has on the mountain. She shows professionals and non-professionals alike that snowboarding isn‘t always about the hype of winning money and recognition, but about enjoying snowboarding for snowboarding‘s sake. Check out Madison Blackley and the Too Hard crew on Vimeo.